My old camera's still down and my insurance claim is taking its sweet time, so I've invested in a new camera for use in the kayak, a pentax optio W30. So far so good, not much of a learning curve and it's nice and small. Anyway, this weekend I decided to go to Cadboro bay again with the group. It's becoming sort of a training ground for me. All kinds of conditions all in one spot. This week we were gifted with slack period and beautiful weather (between storms as usual). We hurried over to cadboro point to see this mysterious "slack current." Last week this place was a large river with overfalls, and paddling it now, it's a complete mirror. We passed some rather nice real estate on our way out and overall everything was going great until we rounded the corner. As we came around the corner of Ten Mile Point, our progress forward slowed considerably. There was a current running around the whole area. The sun also had a smart halo around it, meaning we were in for some interesting weather in the next little while. I paddled out toward Gordon head and looked behind me. No one there. Looking at the GPS track after the fact, I kind of see why. Every time I stopped to take a photo, I was being carried backward in the ebbing current. I was losing sight of them as I kept up the march for Gordon head. 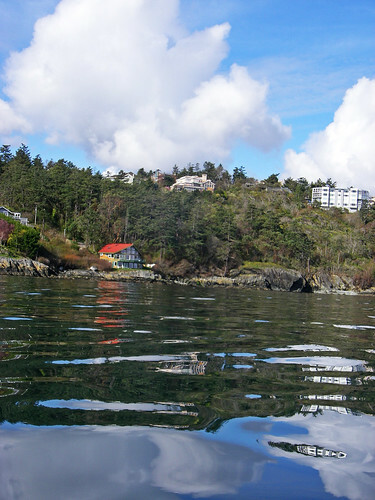 Gordon head is sort of a mirage when you're on the water. 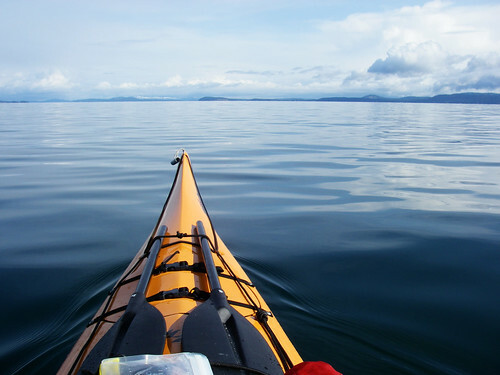 It seems so close, but the more you paddle the more you realize it's further away than it looks. In the end I decided to turn around by telegraph bay and not keep them waiting. The minute I turned around I was sailing along in the current and gentle swell and really got some great speed going. I love it when the hull makes an all new type of noise cutting through the water. 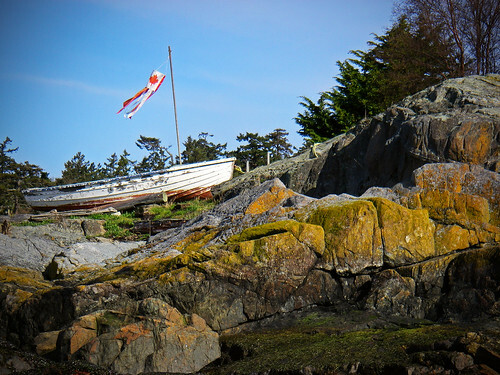 We used the narrow passage at Cadboro Point to slingshot right into Cadboro Bay again. 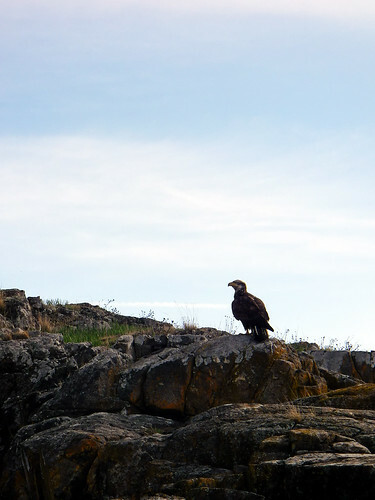 Just as we rounded flower island we saw a juvenile eagle we've been keeping track of for a while now. He sat there while we took his star photo and then he got bored of us and flew off. Form there it was back to the beach in mirror calm water as a huge rain squall started to blot out the sky. We made it back to the cars and got changed before it got grey and dumped mixed snow/rain.